Get an efficient means of coupling two cables using the Cables To Go 1-Foot DB9F to DB25M Serial Adapter Cable. Coming at an affordable cost, this device transform existing DB9 ports to DB25 or vice versa letting you extend your existing cables. The molded design eliminates outside EMI/RFI interference while also allowing a versatile use. 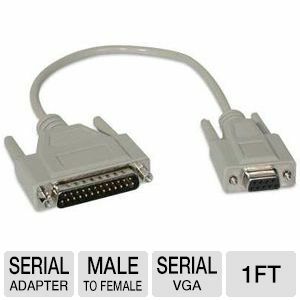 Grab the Cables To Go 1-Foot DB9F to DB25M Serial Adapter Cable and continue using your existing serial or modem cables.